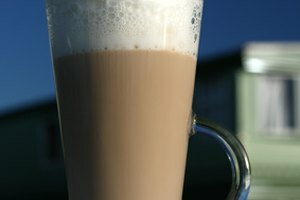 Frothing, or foaming, soy milk is the process of using steam to heat it and mix in air to create bubbles. 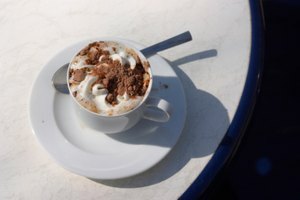 The heat causes the milk to taste sweeter, leaving your coffee drink with a sweet, creamy foam on top. Most milk substitutes can be frothed, though the quality may suffer. Soy milk can be frothed similarly to cow's milk. However, the quality of the foam will depend on both the composition of the liquid used and the technique and skill of the barista. Different brands of soy milks may vary in density and fat to protein ratios, causing them to froth differently from each other. Nutritionally, soy milk has a fat content about halfway between those of skim milk (0 g per 8 oz.) and whole milk (8 g per 8 oz. ), giving its foam stability and a richer texture. It is lower in proteins than cow's milk, which may make it more challenging to froth. Starting with refrigerated soy milk will give a better froth than room temperature milk. Because soy milk has about half the sugars of cow's milk, a sweetener may need to be added before frothing to achieve a similar flavor. 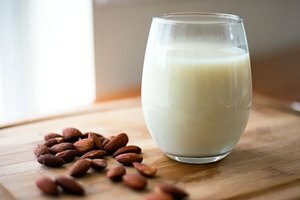 Soy milk can make a healthier alternative to cow's milk, having only slightly more calories than skim milk and less saturated fat per serving than whole milk, while keeping the creamier texture of whole milk. 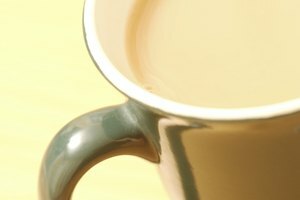 For a tasty coffee treat, try foaming flavored soy milks as well as plain.